COLLEGE PARK, Md. – Corporate Office Properties Trust (“COPT”) (NYSE: OFC), in partnership with the University of Maryland, will break ground on a new 75,000-square-foot building at 5801 University Research Court. The building aims to attract businesses and organizations that focus on research and technology, as COPT’s existing 240,000 square feet are 100% occupied. 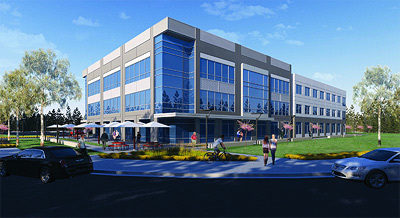 Located near a current Green Line Metro stop and adjacent to a future Purple Line stop, this is the third building in the joint venture partnership between COPT and the university. Consisting of three 25,000-square-foot floors with flexible floorplans and Class-A finishes, the building will also include an outdoor plaza to provide an enhanced pedestrian experience that maximizes the value of its proximity to growing retail and residential options nearby. The public-private partnership between the university and COPT encompasses 128 acres dedicated to research and innovation, and is home to leading research organizations in environmental and earth science, food safety, agriculture policy, language and national security. Nearby buildings are fully at capacity, and construction of a building on spec serves as an indication of office market trends in Prince George's County, according to leaders in the region. Adjacent to the university and bordered by Paint Branch Parkway, Kenilworth Avenue and River Road, this area was honored as a 2015 Outstanding Research Park by the Association of University Research Parks.